Even though I specifically remember enjoying Wild Wild West when it was originally released, I now understand that it is a more forgotten film in Will Smith’s filmography. 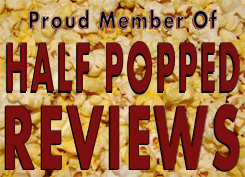 If you bring it up, people might go, “oh yeah, that one movie,” but hardly anyone probably even has it on their radar – and most definitely don’t have it on their DVD or Blu-Ray library…even if they’re a big fan of Big Will like myself. I wouldn’t necessarily call it a bad film, I just wouldn’t say there’s any real reason to watch it multiple times…it’s just okay for the most part. Meet Captain James West (Will Smith) and Artemus Gordon (Kevin Kline), two people working under the current U.S. President, Ulysses Grant. Not too long ago, a number of scientists went missing and it is their job to find them through a number of clues and dead bodies. Behind everything is the mysterious Dr. Loveless, who has a dastardly plan in store for the President. Weirdly enough, I had a little bit of trouble following the plot about the scientists, because even though it was present the entire film, it was dealt with as if it were only a minor storyline. Instead, it wanted to focus more on a lot of comedy based on that era in time as well as the numerous inventions that Gordon spent his life on…even if they didn’t always work like they were supposed to. If his inventions weren’t enough, you also had inventions coming left and right from Loveless and his, I’m guessing, scientist slaves who keep creating things for Loveless that are in all actuality – extreme. At the same time, I get it. It’s almost cracking a joke on James Bond’s 007 series…except just in the old west. That’s fine, but it just kept coming and coming and I wanted to get back to the main story, unfortunately. Like I said, though, the main story was a little drowned out, apparently on purpose – and that’s not always the smartest move in film. What I meant by extreme was Loveless wanted an 80-foot spider to blow things up in a big way – which would in turn act as an ultimatum with the President. Okay…so why waste all that time and energy on a huge mechanical spider when you can just rig up a load of C4 and have the same effect? It looks nice, but the logistics of the thing is kind of stupid when you think about it. I do want to point out that as a kid, this movie was fantastic. Not only was it Will Smith doing his thing once again, but I think it was Burger King that had some really fantastic toys based on the movie…and it always felt like I played a part in that world with my super-spy pen from the old west. I didn’t care about the story, because what was technically happening was not only nice to look at and hilarious, but it was just fun in general. The film may have attempted to target the wrong audience, but there is an audience for this movie…I just don’t think they’ll ever see it. 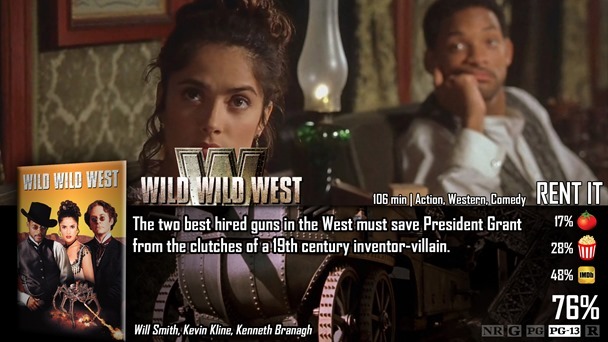 Wild Wild West is a pretty fun movie in general once you forget about the actual plot of the movie – watching Will Smith fight off all the bad guys and Kevin Kline create 007-like inventions is just…fun. The plot of the movie is barely touched on because it wanted more focus on humor, inventions, and strange characters that just say puns all the time. I won’t even talk about the TV show this is based on, because I don’t care, I really don’t. Did you blow past MIB3, or are you just taking a detour, as this really felt like it was trying to be Men in Black in the Wild West (or Wild Wild West as it were) it’s been a long time since i watched it, and it was during a get together so i wasnt paying much attention to it either. I mostly remember it through the story about Superman Lives as told by Kevin Smith. I thought about that just a few minutes after I wrote my comment. I just assumed since I watched all 3 and am reviewing them then you must be too, instead of the more likely scenario that you watched it and reviewed it when it came out just a couple years ago. I’ll look it up when I have a few mins, mine’ll be up later this week.